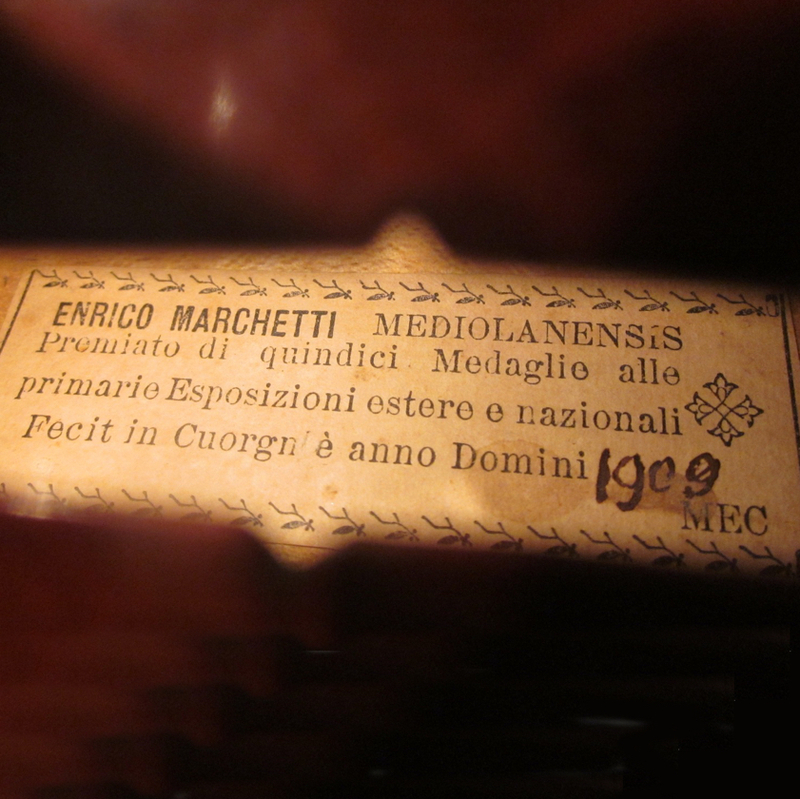 One of the finest Turinese makers of the 20th century, Enrico Marchetti moved to Turin in 1874 and apprenticed early on in the workshop of Benedetto Gioffredo ‘Rinaldi’ and later in the shop of Antonio Guadagnini before opening his own business in ...Read More 1881. His early work showed great promise and was awarded numerous medals. After a 20-year period of frequent travel between Turin and the Piedmontese town of Cuorgné, Marchetti returned to Turin around 1912, where he worked steadily until his death in 1930. Labels were changed or modified to reflect his whereabouts, though many of his middle-period works probably bear false labels. Marchetti’s output is an interesting juxtaposition of personal style and expert imitation of Piedmontese models that may have crossed the line into forgery, especially during the Cuorgné period of his career. In his signed work more personal touches include an elongated head shape with painted scroll chamfers, purfling that extends deep into the corners, and occasionally a two-layered application of varnish, with a harder yellow first coat followed by a softer red. Late in his career Marchetti’s work becomes more haphazard and his original features more extreme, especially the tilted f-holes, and is of marked contrast stylistically to earlier periods. - The auction record for this maker is $129,763 in Feb 2007, for a cello. - 87 auction price results.